Tall wood buildings have gained recognition with the recent developments of mass timber products such as glue-laminated timber, cross-laminated timber (CLT), nail-laminated timber (NLT), dowel laminated timber (DLT), laminated-veneer lumber (LVL) in mass timber formats, mass plywood panel (MPP), etc. However, not all tall wood buildings are constructed solely out of mass timber products such as glue-laminated timber, cross-laminated timber (CLT) and other large-format timber products. Recent mass timber buildings in Vancouver, Amherst (Massachusetts), Atlanta, and Seattle carefully incorporate concrete and steel according to their specific load-bearing characteristics. Two methods are hybrid systems and composite structures. Hybrid systems combine mass timber components with structural components of other materials. For example, a building can have timber floor panels supported on steel columns or precast concrete beams and columns. Some buildings have concrete cores or steel braces to resist lateral forces (from wind and earthquakes) and wood-based structural systems to resist gravity loads (self-weight, occupancy and snow). In areas where buildings are at a high risk to earthquakes, it is possible to have concrete frame for the first and/or second floors and mass timber frames for the floors above to eliminate a “soft storey” at the base where the building is sensitive to seismic forces. Composite structures combine wood and other materials to form a structural element. The other materials are used to enhance the behaviour of the timber. 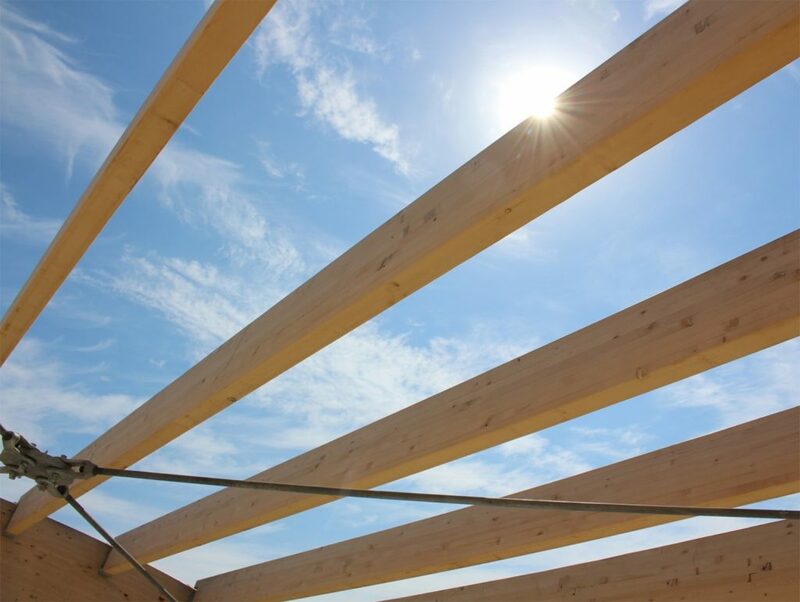 For example, a floor element can be composed of a reinforced-concrete topping on CLT panels with pre-engineered fasteners used to connect the two materials. The added concrete can enhance the strength and stiffness and contribute to fire performance, provided that acoustic performance is addressed. David Moses speaking about tall wood buildings in the news. By incorporating other materials with mass timber, a wide array of options open up for tall wood construction; each with its advantages and disadvantages. This is not to say that tall wood buildings cannot be constructed using only mass timber. Past construction and research projects have demonstrated that tall wood buildings can be built in mass timber without incorporating other materials. Currently, no one system is generally preferred. Whether constructing using only wood, or hybrid or composites, designers and builders should always consider what system best achieves the project goals for building performance, constructability, fabrication, and sustainability. Contact us to find out if tall wood is a good option for you. Sign up for exciting news, events and the latest industry updates.